Is A Solo Or Skywalker Child In Episode VII Enough? Rumors have been spinning since new Star Wars sequels have been announced that the movies will feature one or more Solo or Skywalker offspring. 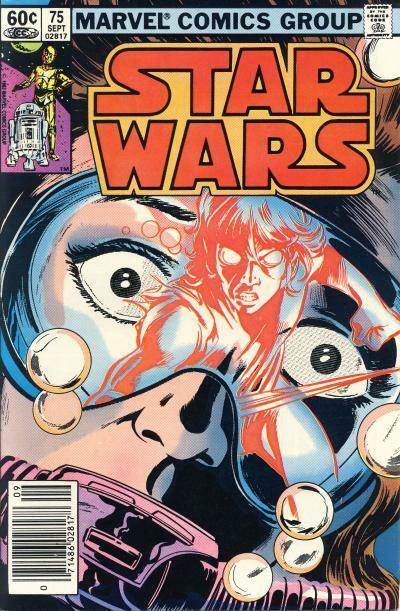 Some comic collectors are betting this will be the case; Star Wars Tales #19, which contains a story with Ben Skywalker, has been selling for up to $75 on eBay and Star Wars: Dark Empire II #5 and 6, a story with babies twins Jaina and Jacen Solo, have brought up to $30 for the pair. Is this speculation warranted though? I know comic book speculation on movies is rampant these days and trying to make sense of it can be difficult. I marveled last year when the Guardians of the Galaxy movie came out and Marvel Super-heroes #18, the first appearance of a team that only had the team name in common with the characters in the movie, rose in price. I likewise was dumbfounded when speculators started hyping Howard the Duck, yes Howard the Duck, because of a post screen reveal at the end of Guardians of the Galaxy. Speculators are hyping comics with tenuous connections to movies and in some cases hyping characters in the hope they are movie bound. While it is likely some characters will see the silver screen, it is also likely many will not. Are comic fans really clamoring for another Howard the Duck movie when even the Hulk has been shown to not be able to support a solo movie? Marvel and DC have thousands of characters that make up their comic universe and when you add in properties from Image, Dark Horse, Valiant, IDW, Boom, and other smaller publishers, the number of characters that can potentially be used by Hollywood are astonishing. And the majority of those characters will never make it to the big screen. And in some cases when those characters do, like Arnim Zola, the final product on the screen is so different from what appeared in the comic pages, does it really warrant the speculation? How many fans though the computer in Captain America: A Winter Soldier did Arnim Zola's character justice? Is a name drop enough to warrant paying more for the comic? What does all this have to do with the possible inclusion of a Solo or Skywalker child in Star Wars: The Force Awakens? I'm hopeful we will get a Skywalker or Solo heir, but I am doubtful we will get Ben Skywalker or Jaina and Jacen Solo. Lucasfilm/Disney made the decision last year to jettison the Expanded Universe, those stories told in books, comics, video games, etc. so future movie writers are not hamstrung by what has come before. While it makes sense that future writers will borrow ideas from the Expanded Universe, it doesn't make as much sense that they will borrow characters unchanged. Ben Skywalker is a character created solely for the comics, in a tale that was already outside the continuity of the Star Wars universe. It kind of makes sense why there is a premium placed on this character over Jaina and Jacen Solo who first appeared in novels. But if Luke does have an offspring in the movie and his name is Jeff Skywalker instead of Ben Skywalker, is a premium on Ben Skywalker warranted? Is Luke Skywalker having a child in the movie enough to keep the prices for the first appearance of an tenuously related character in a comic book elevated? Comic collectors collect runs of titles, followed their favorite characters, and yes, seek out the first appearance of characters. But, have we gotten to the point now where comic collectors are going to seek out the first appearance of a character idea especially when that idea is as obvious as an offspring? 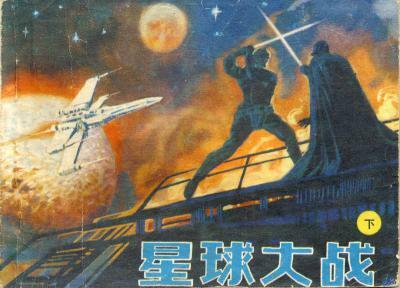 These Chinese Star Wars comics are three different adaptations of The Empire Strikes Back. All of them take liberties with the depictions of characters, sets, or space craft from the movie. In all these adaptations the artwork is extremely competent. 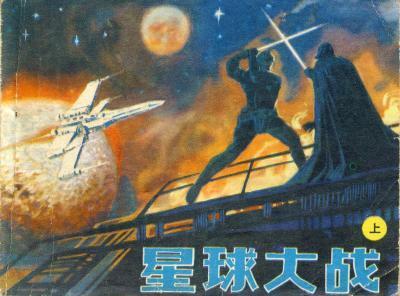 The first Chinese adaptation of The Empire Strikes Back looks like it was done by the same artist that drew the Chinese Star Wars comic posted by Maggie Greene. It is a nicely drawn comic, if not flawed by the quirks of the artist having not seen any of the Star Wars movies. The cover is the familiar romance-oriented movie poster which hides the odd interpretation found inside. Inside, pilots are drawn either wearing NASA inspired space suits or wearing fighter pilot uniforms. Some of the spacecraft looks like modern Air Force jets with double wings. Chewbacca looks more like a monkey than a Wookiee. Perhaps the weirdest scenes in the comic are when Yoda is riding on Luke Skywalker's back during Luke's training sessions on Dagobah. Yoda is drawn like Radagast from The Hobbit movies and seeing this man on Luke's back is pretty funny stuff. This next Chinese adaptation of The Empire Strikes Back is a beautifully drawn comic. This is the most faithful of The Empire Strike Back adaptations although there are some quirks. 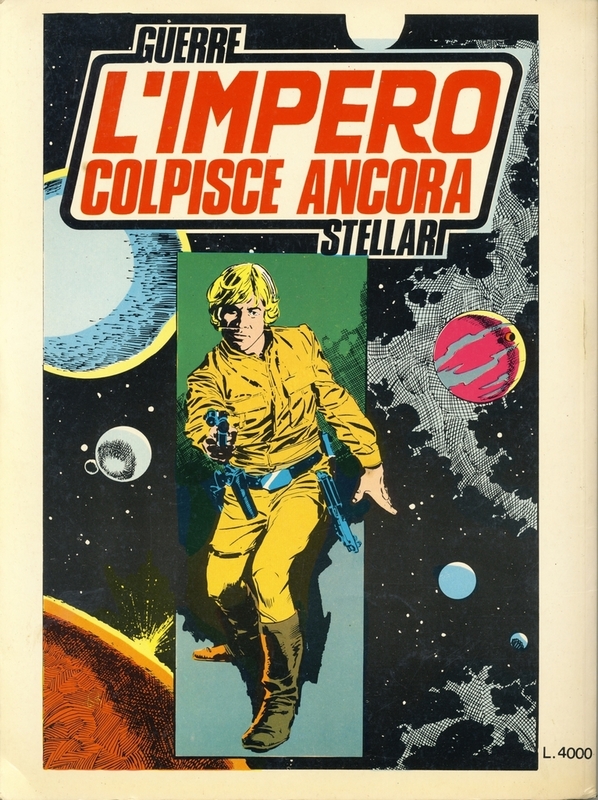 It is possible the artist used the Al Williamson's Marvel Comics artwork for The Empire Strikes Back as inspiration, because Yoda looks very much like the Ralph McQuarrie pre-production Yoda shown in the Marvel Comics Illustrated Version of the Empire Strikes Back paperback. Boba Fett is absent from the story and on Bespin, Chewbacca looks more like a burly Frankenstein than a Wookiee even though he looks like our Wookiee earlier in the story. 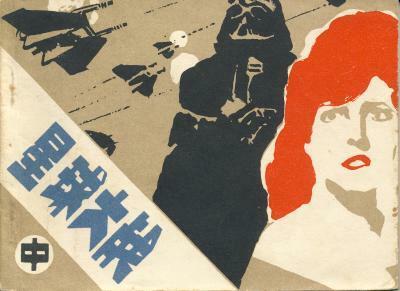 The final Chinese adaptation of The Empire Strikes Back came out in 1989. The art in this comic was done by someone who had access to photos from the first Star Wars movie. Both Luke Skywalker and Princess Leia are drawn in the clothing they wore in the first movie throughout the comic. The story follows the movie mostly, but Han Solo is eliminated completely with the role filled by Luke. Luke escapes from the Wampa and returns to the base without Han's assistance. After the escape from Hoth, Luke is piloting the Millennium Falcon with Leia and together evade the space slug and Imperials. Dagobah is never visited and Boba Fett never appears. Luke is the one who greets Lando on Bespin. The scene were Han Solo is frozen is skipped and at the end Luke battles Darth Vader mostly like the movie shows. At points in the story, Han Solo photos are referenced, but they are slightly changed to make them appear like Luke Skywalker. Additionally, Peter Cushing's likeness is used on an Imperial office half way through the adaptation. 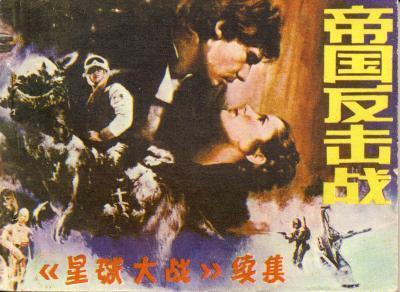 The Maggie Greene discovered Chinese comic adaptation of Star Wars: A New Hope is not the only adaptation of the movie in the linhuanhua format. 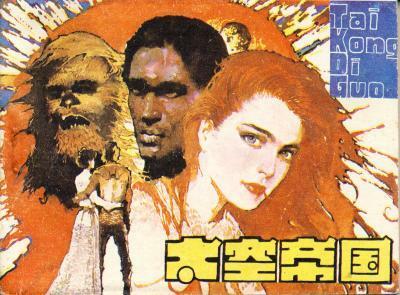 This Star Wars adaptation was drawn by someone who had access to the movie or photos from the movie. In fact, many of the drawings are so much like pictures from the movie, the artist could have traced those pictures. This comic is a faithful adaptation of what was seen in the movie. The cover art is as accurate as the interior art. The next two Chinese Star Wars comics contain the Star Wars story again, but this time it is told over 2 issues. The artist on these two issues has a very similar style to Gold Key's legend Jesse Santos with lots of swirly line work. From the artwork, the artist would have seen still photos from Star Wars and The Empire Strikes Back, but definitely has not seen the movies. 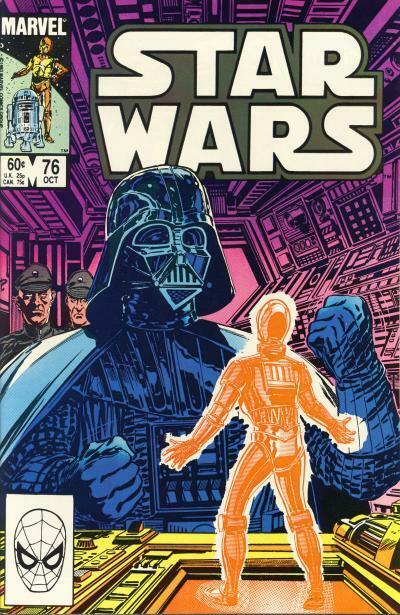 These comics were released a year before the Return of the Jedi, but the covers (which are identical) look like the they are inspired by the scene where Luke Skywalker battled Darth Vader on the Death Star in silhouette. I'm guessing the advanced Revenge of the Jedi poster was the inspiration for these covers. The story line in these two comics follows the movie pretty closely, even though the details are strange. Princess Leia is wearing her Bespin gown. Luke Skywalker is wearing dark slacks and not the familiar tunic. Chewbacca looks more like a monkey than a Wookiee. When the droids escape from Tantive IV, it looks like the U.S. military is contemplating shooting them out of the sky. Tatooine is drawn like a desert, complete with cacti. The landspeeder looks like a craft from a Buck Roger's episode. All the story elements are here, but the art and details are definitely different. All these Chinese comics are redrawn from the U.S. Star Wars comic strips originally published in U.S. newspapers in the late 1970s and early 1980s. It is possible they were redrawn to fit the lianhuanhua format. The first two comics closely follow the Russ Manning art from the comic strip and only upon close inspection are the differences noticeable. The final comic is a crude redrawing of the Russ Manning strip and loses Manning's distinct style. The artist appears to change about half way through this final comic as well. All these comics contain pages with one art panel with word balloons and some text in the margin where the pages are connected. 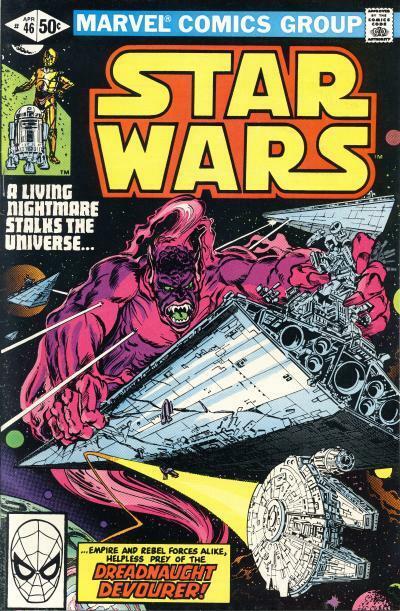 This Chinese comic contains two Russ Manning Sunday only Star Wars strips; The Constancia Affair published from March 11, 1979 - July 8, 1979 and The Kashyyyk Depths published from July 15, 1979 - September 9, 1979. The cover for all these comics are minimalist in style and the layouts are clearly meant to link these comics as part of a series. 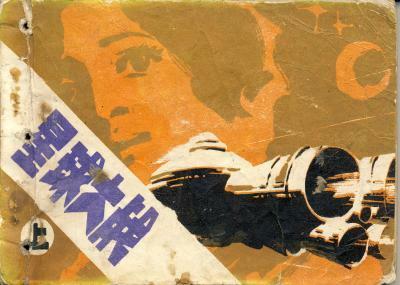 This particular cover shows Princess Leia's profile and a generic spacecraft. 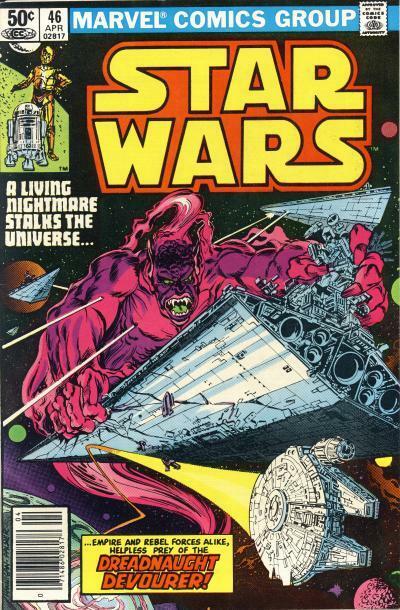 The inclusion of The Kashyyyk Depths is interesting, since this is the one of two Star Wars comic strip that has not been reprinted in comic book form in the U.S. The other strip is titled Planet of Kadril. 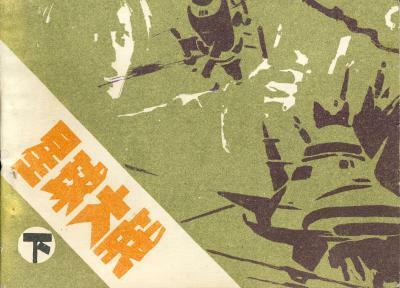 This next Chinese comic contains the Russ Manning Star Wars strip Second Kessel Run published from January 1, 1980 - February 25, 1980. The minimalist cover shows Darth Vader and an unknown redhead female. The story does contain a blonde female with an implied attraction to Luke Skywalker. Over the years, most females that Luke has mutual attractions for have red hair, so it is ironic the female on the cover is a redhead. The spaceships on this cover look like the Buck Roger's Earth Defense craft from the 1979 Buck Rogers in the 25th Century TV series. This final Chinese comic contains the Russ Manning Star Wars strip Bring Me The Children published from February 26, 1980 - April 21, 1980. This cover shows another Princess Leia profile and a couple of generic spacecrafts. The Chinese lianhuanhua is a particular format of Chinese comics. The Star Wars Chinese comics measure 5" x 3 5/8" and those translating published U.S. material contain word balloons while those containing original content have text below the pictures. In some ways, these Chinese comics are similar to Big Little Books published by Whitman, except every page contains a drawing and the text is below the drawing, not on the opposite page. The first large awareness of Star Wars comics published in China came in 2014 when Maggie Greene unearthed  and Nick Stember translated  a Chinese comic adaptation of Star Wars: A New Hope. 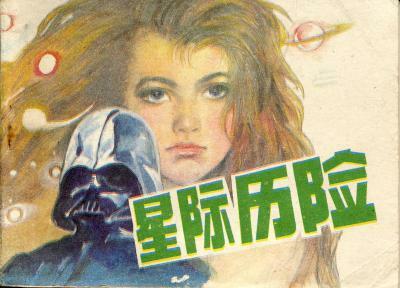 Since then, several more Chinese Star Wars comics have surfaced. 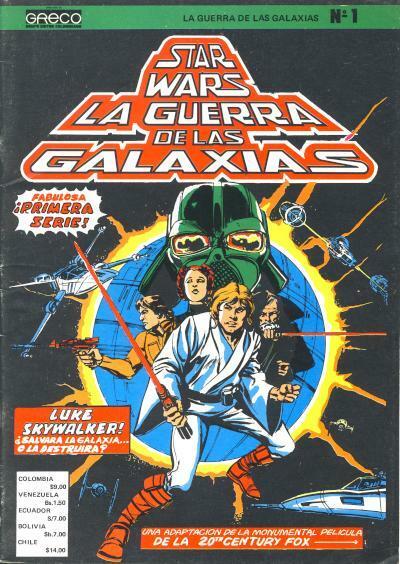 In addition to the comic translated by Nick Stember, I have found 3 comics translating published U.S. comic strips by Russ Manning, 3 comics adapting Star Wars: A New Hope (one is a standalone comic and two are parts 1 and 2 of the story), and 3 comics adapting Star Wars: The Empire Strikes Back. All of them were published in the 1980s. 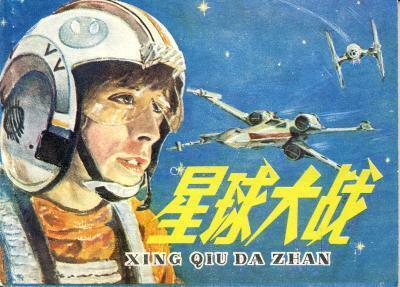 I believe there are probably more Chinese Star Wars comics ready to be discovered. Star Wars: Purge contains a story that Star Wars fans had been clamoring for since Obi-Wan Kenobi told Luke Skywalker that Darth Vader "helped the Empire hunt down and destroy the Jedi Knights." Released in December 2005 by Dark Horse Comics, this one-shot immediately sold out at retail. 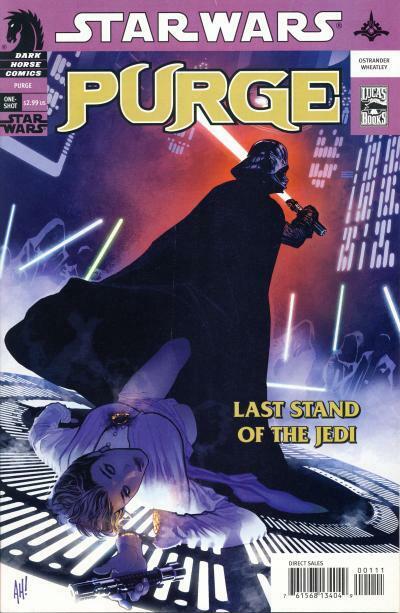 Due to it's success, Dark Horse published 3 followup titles to Star Wars: Purge. 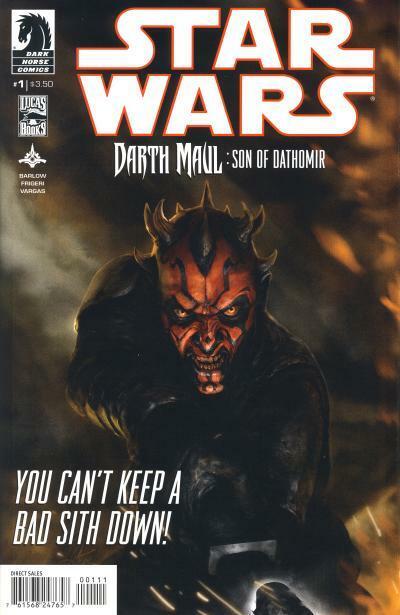 There are several Dark Horse Star Wars comics that have been strong back issue sellers since they were released. This is one of those issues, commanding $10 - 20 for the past several years. This is one of a few Dark Horse Star Wars issues that also had cover problems from the printing process making NM or better copies a little harder to obtain. By now, everyone has had a chance to view the Force Awakens trailer that was released on April 16, 2015. Several sites picked up immediately on the similarities between the Kylo Ren villain in the trailer and the Darth Revan character from the Knights of the Old Republic video game. 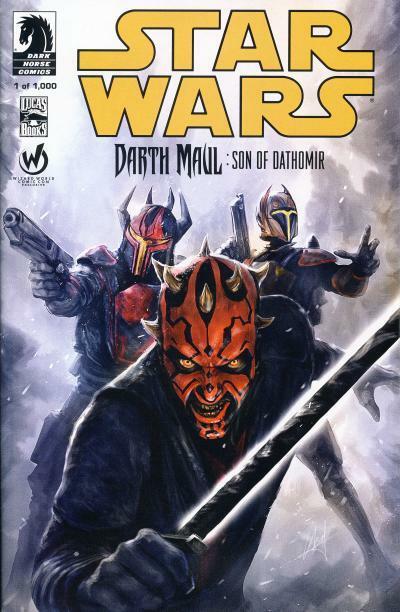 Darth Revan appears several times in the Knights of the Old Republic comic series, but his first appearance in a comic is in Star Wars Tales #23. Darth Revan appears in a single panel in a flashback in a story titled Shadows and Light. He is the character in shadows wearing the robe in the left most panel. Interestingly, copies of this comic have dried up on eBay with the remaining copies priced at $20 or more, no doubt due to the speculation surrounding this character. While there is no doubt Darth Revan's look was an influence for Kylo Ren's look, it remains to be seen if Kylo Ren is Darth Revan or Darth Revan is just used as inspiration for the look of this new villain. 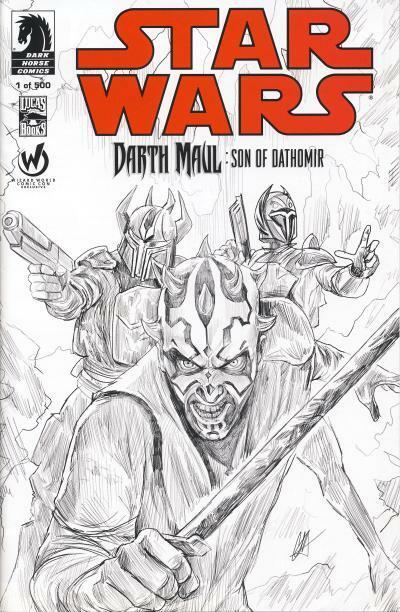 A year ago, Dark Horse Comics began publishing the mini-series, Star Wars: Darth Maul - Son of Dathomir. This is the last series Dark Horse would start publishing for their Star Wars line and is the first comic series in the new canon. This is also the only series Dark Horse published that is considered part of the new canon. The series is an adaptation of sixth season scripts for Star Wars: The Clone Wars animated series that were never produced. For the first issue of this series, Dark Horse published a Las Vegas Retailer Summit variant, 2 Atlanta Wizard World Comic Con variants, and a San Diego Comic Con variant in addition to the standard issue. The notable variants though are the 2 Atlanta variants. At just 1000 and 500 copies each, these are some of the lowest printed Dark Horse Star Wars issues in their 23 years of publishing Star Wars comics. The Star Wars title continues to lead the pack (and the sales chart) with over 200,000 copies. Kanan Last Padawan #1 debuted with over 100,000 copies, which is very strong for this relatively new character in the Star Wars mythos. Both Darth Vader and Princess Leia also have a decent showing with each selling over 100,000 copies. Please read the blog posting April 2015 comic sales break records aplenty; $9.99 Deadpool #45 top dollar item. 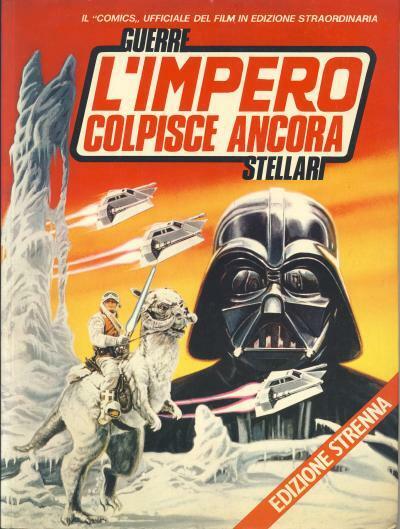 In 1980, along with the paperback version of The Empire Strikes Back, Italians also received a trade paperback Guerre Stellari: L'Impero Colpisce Ancora. Measuring 8" x 11", this trade paperback contains the altered Yoda pictures which look more like the movie Yoda. What makes Canadian and British pence copies unique among foreign Star Wars editions is they are printed on the same presses as the U.S. editions. At times over the years, Marvel Comics felt it was necessary to print a different cover for Canadian newsstand copies to account for the different valuation between a U.S. and Canadian dollar. Marvel Star Wars #64 - 107 all have Canadian newsstand copies as well as Star Wars Annuals #2 and 3, Return of the Jedi #1 - 4, Marvel Movie Showcase #1 and 2, Ewoks #1 - 14, and Droids #1 - 8. Because of the lower Canadian population and the shift from newsstand to direct, these Canadian editions are harder to find than their U.S. counterparts. The only difference between the Canadian edition and the U.S. edition is the cover price. 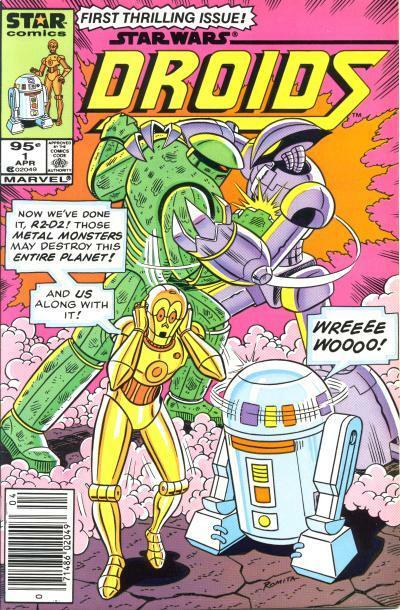 The Canadian edition of Droids #1 is priced at $0.95 where the U.S. edition is priced at $0.75. Marvel Comic's Star Wars titles have taken 4 of the Top 10 spots for April 2015, including Star Wars #4 placing in 1st. The freshman title Kanan: The Last Padawan #1 placed 8th, which is very strong debut for a non-movie related title. Head on over to The Comics Chronicles to read more. Forbidden Planet.com offered 2 Star Wars #1 variants in January 2015 like many other retailers. 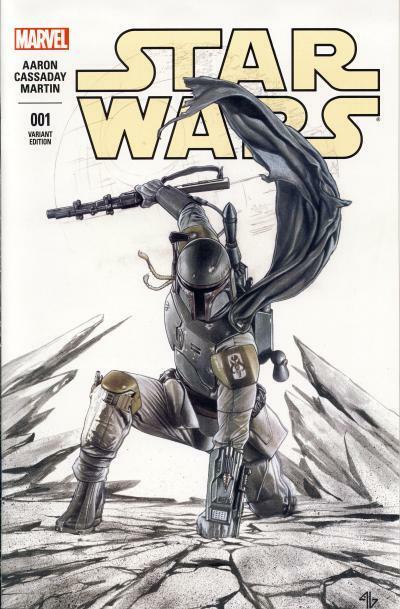 They offered a 3000 edition color version of a Star Wars cover featuring Boba Fett by Adi Granov and a 1500 edition black and white version. Like several retailers who offered a Star Wars #1 variant, both their versions sold out quickly. They ordered another variant, called the "Hoth" variant, which features a black and white background with a color Boba Fett. There are still copies of the "Hoth" variant for sale on the Forbidden Planet.com website, but they all are signed by the cover artist Adi Granov. Four Color Grails is a comic variant subscription service that started in March 2015. 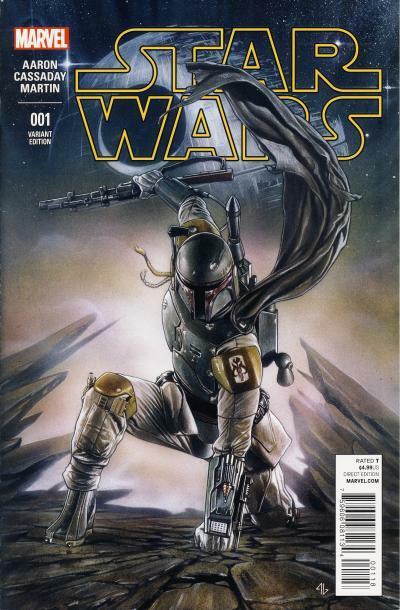 In their first months offering of 4 variant comics was another Star Wars #1 variant that was not included on many of the Star Wars #1 variant checklists that were available on the web. 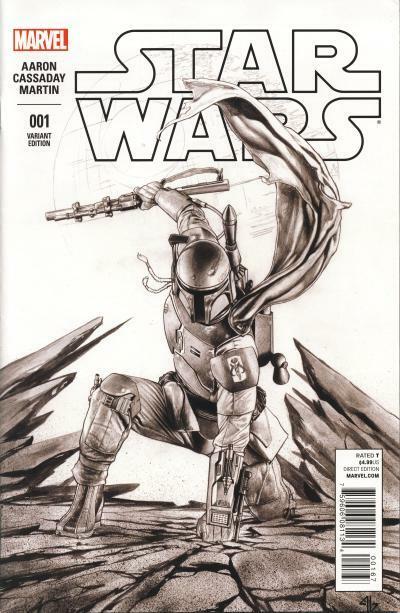 This Star Wars #1 variant features the same art as the J. Scott Campbell 1:50 variant, but is in black and white. The Four Color Grails Star Wars exclusive is still available from Four Color Grails website bundled with the other 3 variants from March 2015 in their shop. Their price is $44.99 for the 4 variant comics, which should be the ceiling for the price for their Star Wars variant for the time being. If you are like me, you might have ordered your Star Wars comics for June 2015 earlier this month at an online retailer. If so, you are going to want to add 2 new releases that Marvel Comics has just announced: Star Wars #1 Director's Cut and Darth Vader #1 Director's Cut. These issues are scheduled for release on June 17 and will feature script pages and in-progress artwork as well as all the story pages from the first issues. Blackthorne Publishing was started by Steve Schanes and Ann Feras in 1985 and at one time was the 5th largest U.S. comic publisher. Previously, Steve Schanes was a co-founder, with his brother Bill Schanes, of Pacific Comics which had gone bankrupt a year earlier. While at Pacific Comics, Schanes created a 3-D comics, Alien Worlds 3D, but Pacific did not publish any more 3-D comics due to poor sales. 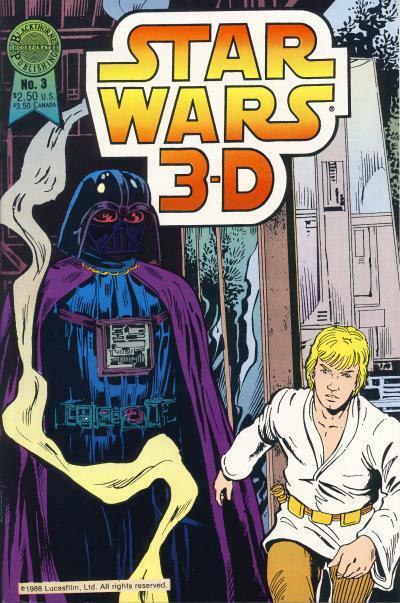 Steve Schanes brought the 3-D comic idea to Blackthorne Publishing however, which published 80 different 3-D comics, including 3 Star Wars 3-D comics. Ironically, a 3-D comic led to Blackthorne Publishings downfall. In 1989, they licensed Michael Jackson's Moonwalker movie as a 3-D comic which proved to be a costly mistake. By 1991, Blackthorne Publishing was out of business. As far as I can tell, only the first issue came polybagged with 3-D glasses. Prices vary widely for these issues. Issue #1 is the most common, and issue #2 and 3 are a bit harder to find in high grade. Ewoks #14 has a cover date of July 1987 and was the last Star Wars issue Marvel Comics published until January of this year. 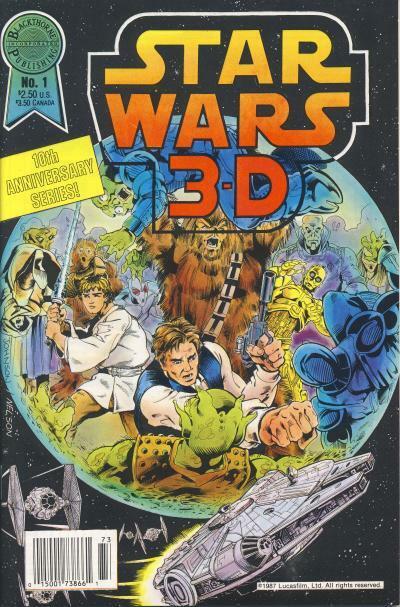 Later in 1987, Blackthorne Publishing would release Star Wars 3-D #1. 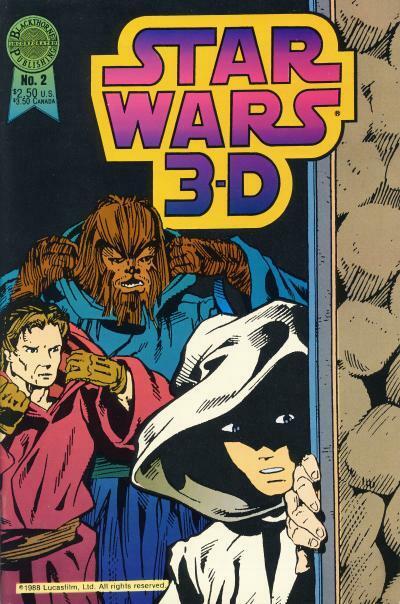 Blackthorne would release 2 more Star Wars 3-D comics in 1988 and we would not see another Star Wars comic published in the U.S. until the end of 1991. 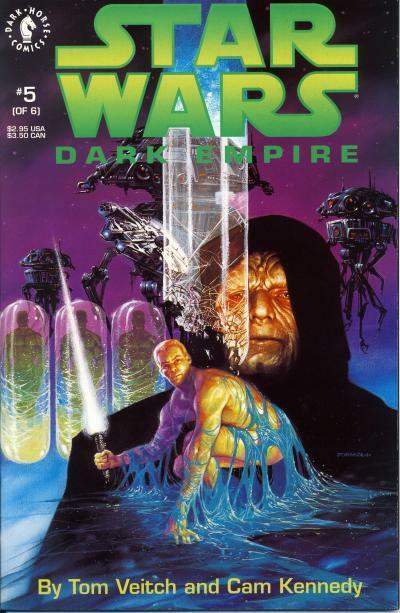 The ad for Star Wars: Dark Empire actually appeared in Marvel Age Preview #1 in June 1990. 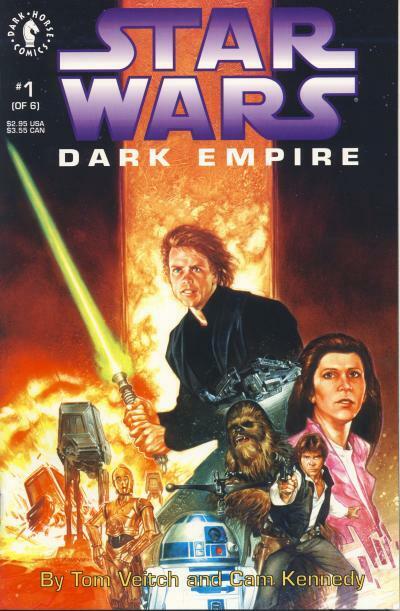 Marvel was going to publish Star Wars: Dark Empire as 3 64 page prestige format issues, but Dark Horse acquired the Star Wars license and published the story as a 6 issue mini-series. 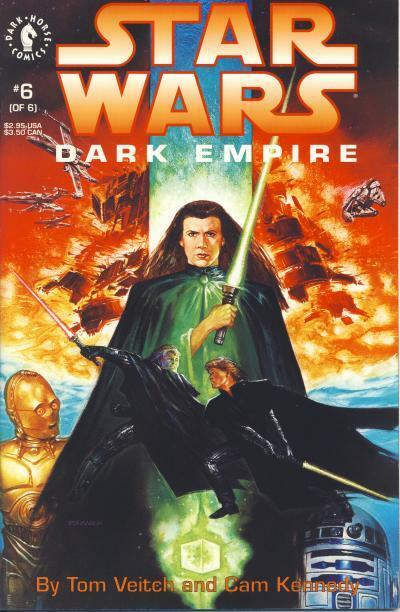 The writer for Dark Empire is Tom Veitch and the artist is Cam Kennedy. 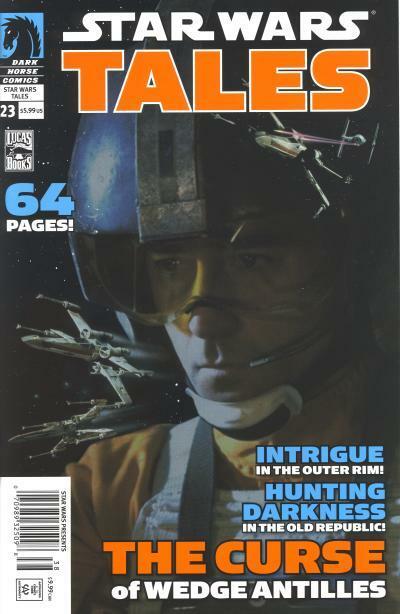 The first issue went on sale in December 1991 and was released bimonthly with the final issue selling in October 1992. 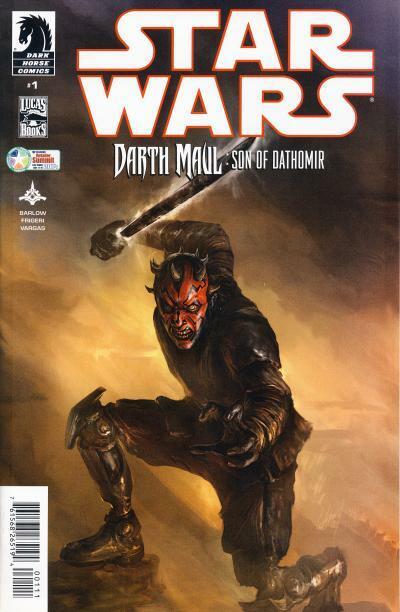 The return of Star Wars to comics was a huge hit for Dark Horse. The first issue sold out at comic shops immediately and went to a second print. (Issue #2 and 3 would also see a 2nd print.) 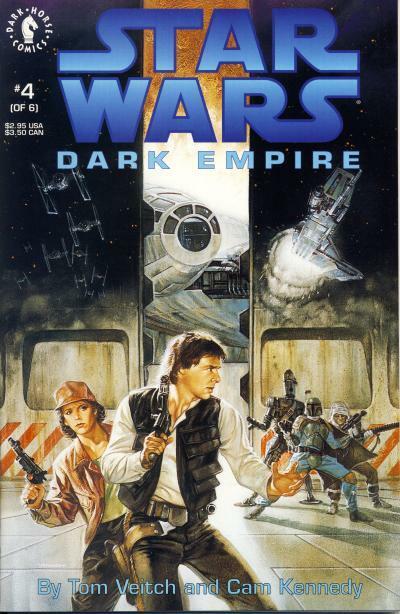 Due to the success of this mini-series, Dark Horse went on to publish Star Wars comics for 23 years; over twice as long as Marvel held the license. 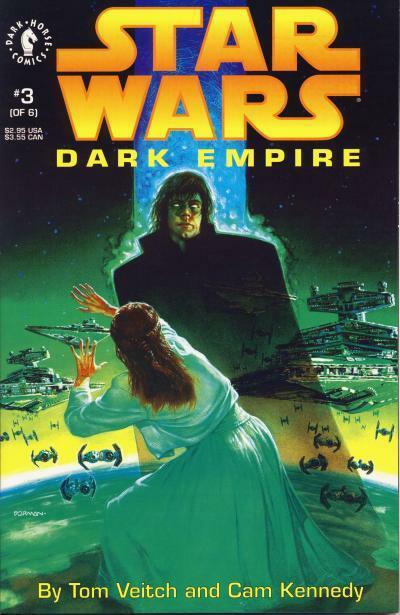 Dark Empire has seen print for most of that time as well in the form of a trade paperback. It would also inspire 2 more comic sequels, Dark Empire II and Empire's End. 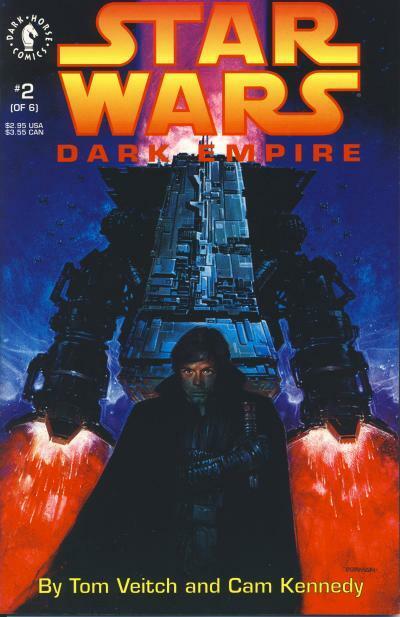 Star Wars: Dark Empire was a serious continuation of the Star Wars story, unlike the final issues of the Star Wars title as well as the Ewoks and Droids titles published by Marvel at the end of their tenure. While it was conceived before Timothy Zahn's wildly successful Thrawn Trilogy, the book series actually beat the comic series to market by 6 months and the Thrawn Trilogy is widely seen as the start of the revival of the Star Wars brand that has continued to this day. In my opinion, this is the most important Star Wars title published by Dark Horse. 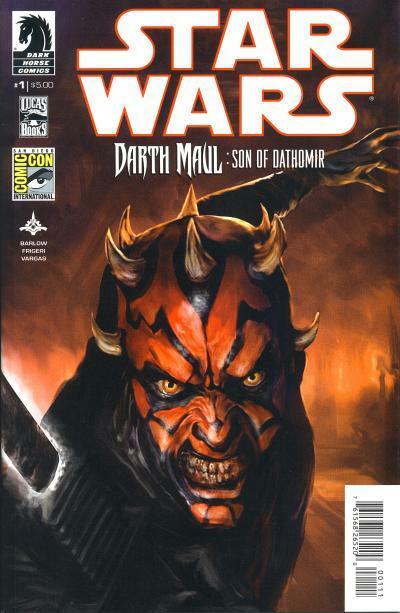 It showed that there was an audience hungry for additional Star Wars tales told in the four color world of comics. The story is grand in scope and logically expands on the situations left at the end of the Return of the Jedi. The art is superb and the story is more mature than any Star Wars comic that proceeded it. It is also one of the most undervalued Star Wars titles; Star Wars: Dark Empire #1 - 6 is routinely sold for $15 - 20 or roughly cover price. My suspicion is the continuous publication of the trade paperback by Dark Horse has subdued the demand for the original issues. The Star Wars movies introduced several droids that were in the services of the Galactic Empire. IT-O is the interrogation droid that is used by Darth Vader on Princess Leia while aboard the Death Star. In the Empire Strikes Back, we are introduced to an Imperial Probe Droid, one of thousands that were dispatched to locate the Rebellion. Also in the Empire Strikes Back, Darth Vader employs IG-88, a bounty hunter to help hunt down our heroes. Finally, onboard both Death Stars, we encounter several droids including: RA-7 (the "Death Star" droid), MSE-6 (the "mouse" droid), and R4- and R5-series astromechs. In Darth Vader #3, we are introduced to a pair of droids, 0-0-0 (Triple 0) and BT-1. These droids are the evil equivalent of C-3PO and R2-D2 with Triple 0 serving as the protocol droid and BT-1 serving as the astromech. These are not the first Imperial droids introduced by Marvel however; the original Marvel title had its fair share of droids that worked for the Empire too. 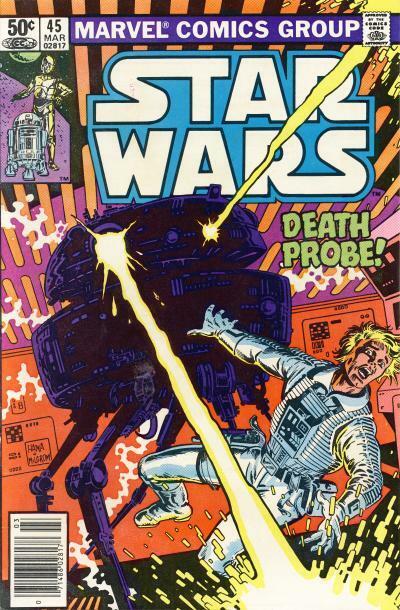 In Star Wars #45, the first Star Wars issue after The Empire Strikes Back adaptation, we are introduced to a specially augmented Imperial Probe Droid, designation 13-K, that takes over a Rebel Blockade Runner and kills all aboard. Luke Skywalker ends up confronting the droid. In the end, 13-K uses the Blockage Runner to ram and destroy a Star Destroyer, a fate it had in mind for the Rebel fleet. 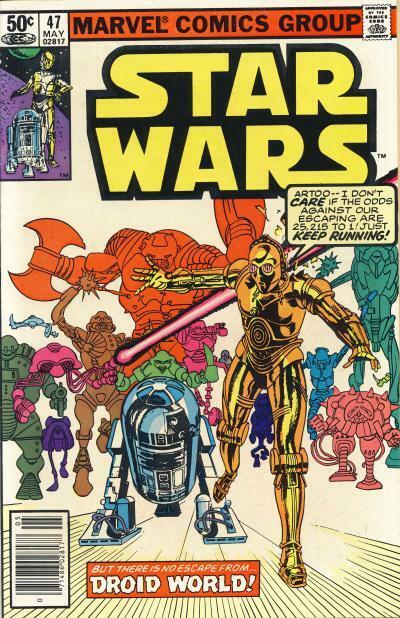 A couple of issues later, in Star Wars #47, C-3PO and R2-D2 visit Kligson's Moon, aka Droid World, to get the schematics for a damaged Imperial Warbot. On Droid World, they encounter Z-X3, an Imperial designed droid used in extreme conditions Stormtroopers were incapable of operating in. Z-X3 plans to take over Droid World for the Empire but is defeated by the planet's namesake, the cyborg Kligson. In Star Wars #75, we are introduced to K-3PX, a protocol droid, that subjugates Lando Calrissian, Chewbacca, and Mone who are on a mission to the planet Gamandar. In Star Wars #76, K-3PX reports to Darth Vader that Luke Skywalker is on the water planet Iskalon. This scene is depicted on the cover of that issue. Marvel Comics announced a new Lando 5 issue mini-series that will start in July 2015. Since Lando Calrissian's first appearance in The Empire Strikes Back, he has had a prominent role in Marvel's original Star Wars title, filling the vacancy left by Han Solo. Two issues after the Marvel adaptation of The Empire Strikes Back ended, Lando would co-star with Chewbacca in Star Wars #46 in a story titled The Dreams of Cody Sunn-Childe! The story starts like many of the post-The Empire Strikes Back tales, with Chewbacca and Lando in the Millennium Falcon searching for Han Solo. The Falcon encounters drive problems and is ripped from normal space and crash lands on a floating island with a large domed city in an alternate dimension. There, they are attacked by a humanoid beast but are saved by another humanoid which looks remarkably similar to the beast called Cody Sunn-Childe. Cody takes Lando and Chewbacca to the city with other inhabitants. At the city, we learn Cody was part of the Rebellion who, along with his fellow Rebels, had a reputation for violence. In his final battle, he fell into a hole where he encountered subterranean beings called the M'usts where he gained incredible powers and was taught about peace. Cody swore off his life of violence and created the island and domed city with his powers and he brought his Rebel companions to live in this domed city in peace. Lando scold Cody for forsaking the war against the Empire and not using his powers to help. As Lando slaps Cody, several more humanoid beasts attack and Cody Sunn-Childe quickly dispatches them and we learn they are actually his repressed violence. Meanwhile, in normal space, a fleet of Star Destroyers led by the female Captain Plikk discovered the tear the Falcon made in space to Cody's alternate dimension. They proceed to open the tear further by firing lasers at it, creating a door to enter the dimension. They succeed in breaking through to the alternate dimension as Lando, now working on repairing the Falcon, is lecturing Cody on his responsibilities to those he left behind. The Star Destroyers begin attacking the city and Lando takes off with Chewbacca in the Millennium Falcon on a suicide mission to confront the fleet. Cody Sunn-Childe is enraged by the attack and unleashes his violence in the form of giant beasts which attack the Star Destroyers. Cody changes his mind though and recalls his beasts. The fleet proceeds to destroy the city, killing everyone in it. A distraught Lando on board the Falcon oversees the destruction and along with Chewbacca leaves the alternate dimension. The Star Destroyers used their remaining power to destroy the city and are unable to follow the Falcon as the dimension's doorway closes. Originally, the story was written with Lando Calrissian agreeing with Cody Sunn-Childe's decision to die instead of fighting at the end, but Lucasfilm asked for the ending to be changed to show that Lando disagreed with Cody. For this reason, John Marc DeMatteis asked that his name not be used as the writer of this issue, but instead the pseudonym Wally Lombego was used. This was the first of many Lando Calrissian centered stories in the Marvel Star Wars title. What started as a joke has now become recognized worldwide as Star Wars Day, "May the 4th be with you." Star Wars fans have quite a bit to celebrate this year: Marvel's new titles have been a smash success and Shattered Empire is just around the corner, Disney XD's Star Wars Rebels was well received and we have Darth Vader to look forward to this season, and most importantly, a new Star Wars movie, The Force Awakens, is being released around Christmas this year.